There IS hope for “Hope of the Future” after all! Over three years ago, in March of 2014 to be precise, I published Darcy and Elizabeth: A Season of Courtship, my “prequel to the sequel” novel. Why I had decided to write into the past, as it were, after writing eight huge novels following the newly-married Darcys into the future, was a combination of prompting from fans and my own internal muse. I felt that the engagement/betrothal period of Mr. Darcy and Elizabeth Bennet was worthy of deeper coverage than the handful of “flashback” tidbits scattered amongst the five novels that comprise my Darcy Saga sequel series. At the time, I was blessed with a seemingly endless number of inspirations! Fresh scenes of the lovers growing to know each other better, as well as expanding upon those scenes already written. For roughly a year, while simultaneously undergoing a massive move from California to Kentucky, I wrote what was originally planned to be one book. That concept shifted into a two-volume “prequel duo” when the ideas still in my mind, together with the content already written, amounted to more material than one reasonably-sized book could handle. Publishing as two books was a sound concept, and I swear that my intentions to complete the second part in a matter of months after releasing the first were sincere. I even created both book covers at the same time! It would have been doable… if everything with me had remained unchanged. As most of us know, life can throw curveballs. Hopefully those curveballs are few, minor, and easily overcome. Alas, this is not always the case. Perhaps someday I will share all that I have gone through these past three years, lay my soul bare, as the saying goes. I do think it would be cathartic, and maybe even helpful to someone else. This is not the place, however. So, without going into the gory details, my profound hope is that everyone will believe me when I say that not finishing the second volume was never a conscious, willful choice. I tried, oh how I tried! To state simply that which is incredibly complex: the muse was gone and I could not write. Period. Any attempts to write, and there have been hundreds, were met with a stone wall. Here and there I managed to string a sentence or two together, a smattering of actual paragraphs even, and once almost a whole chapter. Then the manuscript would sit untouched for months. I would try to work on another project, something totally non-Austen as well, with no real success. The vast majority of my fans have been patient and understanding. I truly cannot express how essential the kind emails, encouragement, sweet praise, faithful support, and blessed friendships have meant to me. This has been my lifeline, my hope. Knowing that readers wanted more, and were willing to wait in love, kept me from giving up entirely. Those of you who know me, even a little, are aware how precious my readers are to me. I thank you all, from the bottom of my heart, for sticking with me. I also MUST thank the incomparable Regina Jeffers. She has been a rock and constant friend, through the worst of times. Seriously, I cannot sing her praises high enough! Persevering with Austen Authors was her push, and I cannot ever sufficiently thank her for holding tight to me and to our dream for this website. This blog, the amazing authors who participate, and the ongoing community-at-large of Austen literary fiction has also sustained me. As long as Jane Austen remained alive and vibrant, then I had a place to return to. There are many, many others I owe a debt to. My amazing husband is a continual source of comfort and support, and without him I would not have survived. Medical doctors got my health issues under control. Above all, God, who is my ultimate strength and peace through the storms. Another huge impact has been the wonderful ladies in my romance writers group. I refused to give up on my Romance Writers of America membership, no matter how often I questioned why I bothered, and the women of Louisville Romance Writers (LRW) never gave up on me. For a writer, even one struggling as I was, being active in a writers community is vital. About six months ago the curveballs stopped coming. The sky started to clear, and I began to believe I could, maybe, just possibly write again. But, I confess, after so long I was… scared. What if I opened the manuscript, again, for the umpteenth time, and nothing came? Fear is a powerful thing! Then, in March, LRW decided to hold a writing challenge. A mini-NaNoWrMo just for us. It was the kick in the arse I needed! I set a personal challenge of 10,000 words for the month. Frankly, I thought I was insane to aim so high. Well, it was rocky for the first week, I admit, but I soon realized that the novella I had chosen to work on wasn’t as close to my heart as the story of Lizzy and Darcy. Fear had kept me from opening the dormant prequel. Nevertheless, I had written a thousand words on the novella (more than I had written in ages) so while struggling, it gave me hope, and courage. Inhaling, I opened Hope of the Future, and…. I WON THE CHALLENGE! Yep! By the end of March I had written 22,742 brand new words! Twice my set goal! For me, this was phenomenal. 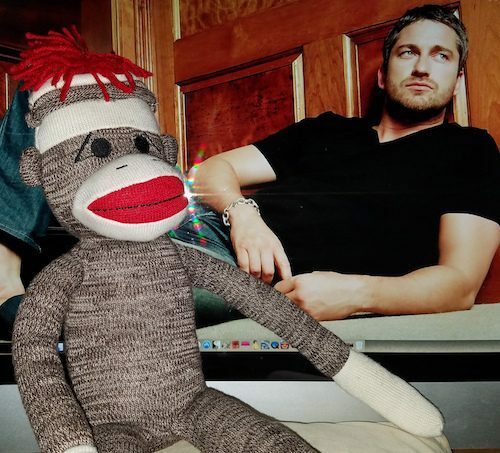 The prize included several items, but the biggie was our group mascot, the adorable Gerard the Sockpuppet, seen to the right with his namesake, the yummy Gerard Butler. I get to keep Gerard (the puppet, not, sadly, the man) until next April. He is my new muse and friendly face in the office as I write. Joy! I have been off and running ever since. April saw a short interruption as I waded through the dreaded taxes and a flair up of my shoulder bursitis requiring several doctor visits, and this month we had a break in the endless Kentucky spring rains for a slew of yard and home projects. Today we welcome dear friends from California for a week-long visit, so that shall keep me from the computer. However, even with that, I have been busily writing! Even with one exceedingly long chapter that required extensive hours of research as I wrote (both a joy and a bane), I have nearly tripled my March word count total. Go Sharon! Now, the million dollar question those of you who have read this far are asking: When will Darcy and Elizabeth: Hope of the Future be released? I do not have a date to give as yet. BUT, my personally set deadline is to have the book fully written and in the hands of my editor by the end of June. God willing and the creek don’t rise (Yes, I am Southern!) this will happen. If so, then a release would be sometime in July. Again, these are tentative dates! What I do feel confident in assuring is that the book WILL be finished, which is something I honestly did not think would happen for a long while. I hope this excites everyone as much as it excites me! I look forward to sharing more as I move along. Keep an eye on my blog: Sharon Lathan, Novelist and my Facebook Page for updates. For now, here is a small excerpt to whet the appetite. Enjoy reading, and please share your thoughts with me! Cheers! “What did he mean by that?” Elizabeth asked once they were outside the room and descending the stairs. Hurrying to his office, he retrieved the two boxes sitting on his desk, and hastened back. Elizabeth hadn’t budged, as commanded, her eyes watching him approach and brows lifting at the sight of the boxes in his hand. Laughing, they exited through the double door onto the wide terrace. The fountain bubbled musically, drowning any sounds coming from the townhouses surrounding. It was a cool evening, but the sky was clear and air fresher than usual for London. Darcy selected a table and chairs directly in sight of the patio doors, which he left wide open. The terrace torches had been lit per his directions, so between those and the lights inside the foyer, there were no immediate shadows to hide them. While this did fulfill Darcy’s promise to Mr. Bennet that they would be within eyesight, another purpose was to clearly see what was inside the boxes, both of which he sat onto the small table. The catch of emotion in her voice was nearly his undoing. Only the task needing to be completed stopped him from drawing her into his arms. Taking the smaller box into his hands, Darcy peered intently into her love-drenched eyes. “This is the ring that has waited, patiently, for me to place onto the finger of the woman I promise to love, cherish, and be faithfully devoted to for as long as I draw breath.” Slowly he lifted the lid, watching her eyes reluctantly leave his to peer downward. Her gasp was sharp and loud this time. Inside the box propped a ring of shiny gold, the narrow band adorned with a one-carat star sapphire of vivid blue, centered between two round half-carat diamonds. Tears were swimming in Elizabeth’s eyes, and after twice parting her lips as if to speak, Darcy smiled and reached for the other box. Sliding it to the edge, he attempted to ease the overwhelming emotions they were both experiencing by making a joke. Suddenly feeling rather giddy, Darcy flipped open the lid with dramatic slowness. No heightening theatrics were necessary, however. Nestled on a thick pillow of white velvet was a stunning necklace of sapphires and diamonds, in various shapes and sizes, masterfully crafted and woven into a spiraling arabesque style. The lights bounced off the polished metal and gemstones as Darcy lifted it off the velvet. He draped it over his palms, Elizabeth reverently brushing her fingers across the sparkling stones. After a minute of awed inspection, he slipped it around her slender neck. Securing the clasp, he gently laid his hands to either side of the dangling necklace, fingers caressing the nape of her neck. Elizabeth was staring at him, her glowing eyes round as saucers and teeming with emotions almost too intense for him to bear. With her left hand she nimbly stroked the teardrop sapphire lying below the hollow of her throat. Her right hand floated upward, contact made on his chin as her thumb traced a lazy circle, before gliding up to his lips. The pressure was light, yet sent rivers of fire over the surface of his mouth. He parted his lips, tongue moving toward the sensitive pad, but her thumb was gone, brushing across the corner of his mouth with the same sluggish pace before drifting up toward his cheek. The warm splay of her entire palm against his face intensified the delicious sensations racing through his skin. Darcy instinctively tilted his head to increase the pressure. Doing so, he realized how far he had already leaned toward her, unaware of his actions. Her luminous eyes were inches away, still open although the lids had grown heavy. In the remaining seconds before he bridged the gap to kiss her, Darcy noted everything. The eager lifting of her face, the tongue sweeping between parted lips to moisten, the sound of rapid breaths, the rich flush infusing her cheeks, and the increasing heat burning the hands still resting on the curve of her neck. ← Why Do We Read and Write ‘Pride and Prejudice’ Variations? 57 Responses to There IS hope for “Hope of the Future” after all! I own 6 of your books in paperback and one on my Kindle and read them shortly after they were published BUT back then I was working and didn’t have time to post reviews. I am now rereading In the Arms of Mr. Darcy as my bedtime reading in order to have the story fresh in my mind in order to finally post a review. This excerpt was lovely and even had my eyes growing moist. I look forward to reading the book. So sorry to read of your problems and pray that they are part of the past. Best wishes with your writing and with this publication. Thanks for sharing. Oh happy day!!! Just what I have longed to see, the second part of your wonderful story! Prayers and good thoughts have been coming your way from over here in Virginia. It is so wonderful to know you are on the mend in all ways with the help of your wonderful husband and true friends. All of us hit one or more bumps in the road along life’s journey. Love and support from those close to us helps smooth it all out sooner. We just wish it were much sooner, but God has his timing for a reason. I am a huge fan, like many others, who has kept that spot on my bookshelf carefully dusted for Hope! So glad to hear you are doing well. Loved reading the preview – and what I was looking for was there, your special style and spirit sang wonderfully through the words! Keep singing Sharon!!! We will keep listening!!! Extremely touching, heart-warming, loving…..absolutely breathtaking….thank you for writing such a moving scene…I can’t wait to read the entire book!!!!! It truly touched me and leaves me wanting to read more. Thank you!!! Glad to hear all is well again Sharon. I look forward to reading the second part of your wonderful novel. Thanks so much, Leslie. I will be keeping everyone informed, I promise! Glad you are doing well and are back to writing, Sharon. And, WOW!, what an excerpt. I can hardly wait for the book. Have been anticipating it a while. Love the cover of this book as well as the first one. All of your books have been wonderful to read. Thanks Mary! Glad you liked the excerpt! I can’t wait to add this to my collection! Worth waiting for. I am sorry to hear of your troubles but I am learning that all things happen in God’s timing….even though we would love to speed it up to fit our own plans. Glad to hear you are back doing one of the things you love. I can’t tell you how excited I am to read this and you have definitely wetted our appetites for more. Stopping the post just as it is getting heated is just unfair. Going to have to read the first novel again now. Thank you, my dear friend. Trials such as this DO tell us a great deal about who we can trust to be by our side when the going is rough. I have been very blessed, but also enlightened in ways I hadn’t imagined. LOL! Sharon, I have missed you so! Welcome back! That was a beautiful excerpt. I am anxiously waiting for more. Whoopee! Thanks Peggy. I’ve tried to stay as active as possible, but it hasn’t been easy. If not for Austen Authors I probably would have faded off into the sunset. But, Regina would not let me do that, God bless her! Here’s wishing you brighter and healthier days ahead. Thrilled to hear the 2nd prequel will be forthcoming. The excerpt was all I was hoping for! My paperbacks of your books will be thrilled to have it join them! Congratulations! I am so glad that you are back to writing again. I have read all your novels and have them in paperback form including the 1st of this set. I have looked many times at Amazon to see if I missed the sale of the 2nd in this series and have never been able to secure it or find it. I am so looking forward to having another one of your novels to read. Also to add to my collection. Thank you for the excerpt and it is intriguing. After your move to the midwest, I followed you in your stories of your house, etc. and then didn’t know what happened but we all have lulls in our lives, some medical, physical, family problems, but I am so glad to hear that you are bouncing back. A nurse has the strength to endure what life throws at her and you have proven that to us! Good luck with the novel and all future novels! You are so sweet, MaryAnn. I suppose the strength was in me somewhere, although many times I didn’t think so. God kept me safe! I am looking forward to reading this book so very much. Hang on, I have to do a happy dance…Stephanie wildly swirling around in her office…whew…Okay… YAAAYYYY so glad you are feeling back on track. I know it’s been fraught with travails and potholes, but you’ve persevered and this is fabulous news! Thanks for sharing the excerpt, looking forward to adding the book to my collection. When I sold 95% of my books in our estate sale last year, yours are some of the ones I kept. So happy for you and your muse. Oh my! I am so excited for this book to be released! I’ve been checking the blogs and Amazon since I finished the first book, trying to be patient. I have an empty space on my bookshelf just where this one belongs. I am so thankful that you are feeling better and have found your muse again. I’m sending warm thoughts and wishes your way! Thanks Mary! I believe that empty space will soon be filled. Yeah! I’m so pleased to read this; I too have been quietly hoping and waiting. Wow! Can’t wait to read the rest of this story! Brava and well done, Sharon! Congratulations, Sharon! This is so wonderful. I’m so happy for you. I’m glad writing is your good companion again, and that you’re doing so well. The covers are both beautiful. Happy Spring! Thank you Summer. You, and all the other Austen Authors, are a continual inspiration for me. So, THANKS! The very very best of luck to you. It sounds like you’ve been through some tough trials. I sympathise with you as I’ve had some rough times myself. Writing must be a wonderful release and I’m so glad you found it again. I never knew how closely tied physical health was to writing inspiration. I will forever have great sympathy for writers who suffer from a block, whatever the cause. It is not something to laugh at or demean. Thanks Renata, for your participation in Austen Authors. This blog is SO instrumental in encouraging me to write. Friends stand by you when your down while others flee. Regina has been a friend like velvet covered iron to my wife, soft yet strong. My wife has other friends also who have been so faithful. To them I say thank you also. To my wife’s many fans who have wondered and waited, I can attest to my wife’s inability to write. Actually to me, her ability to recognize it and not pump out poor writing is more significant. So to Sharon’s many fans I say thank you for your kindness, faithfulness, understanding, and support. My sweetie! Yes, he knows ALL the inside scoop. Thanks, my love. Amazing post Steve. You are a great partner to her! I must say, old girl, it is about time. LOL! My day is packed full, so I am glad I got up early to read the excerpt. Well done, my friend. Yes! Although, in this novel they never are at Pemberley, just to be clear. LOL! But, there will be more of the Darcy Saga to follow. Fingers crossed! I just read the excerpt…. I wasn’t going to but the anticipation was killing me … I found my office at work empty and sat down to read it…. I’m just so glad I was alone…. that was AWSOME ???? So glad life has settled down to hopefully nothing but happy days. Definitely agree on the comment about endless spring rain (Ohio was very wet too). Love the excerpt! Such a sweet scene between Lizzy and Darcy. Can’t wait to read the rest whenever it’s available! Thanks for sharing with us! We are still getting used to how much it rains in this part of the world. After years of drought in CA, we almost feel guilty! Some of our friends out there are like, “Stop posting videos of the storms!” LOL! But, we love the weather here so much, so rarely complain, unless its when the tree sized weeds need to be pulled. Ha! Ah, ’tis swoon worthy, Sharon. Look forward to more. I am really looking forward to having this to round off my collection so thank you for all the trouble you have gone to finishing it and I hope all your personal troubles are behind you and never to return. Thank you so much for sharing this excerpt ? Thanks Glynis! I am pleased beyond words to be able to write again for the sake of my readers, but, shall admit that not being able to write these past 3 years has been a constant hole in my soul. I feel complete again! It is an amazing feeling, and such a relief! Welcome back, I am very much looking forward to reading this! Thanks Lynn! I sure hope I don’t disappoint. There is that fear again. LOL!